We guarantee the durability of this product by offering 18-month warranty, free replacement or a full refund for non-manmade problems. Please contact us freely if any problem occurs. MFi CERTIFIED -- NO damage to your watch, NO error message popping up, compatible with ALL Apple watch models(38mm & 42mm ), supporting to the NEWEST Watch OS, all because it is MFi certified. NEVER EVER cause any troubles when charging. 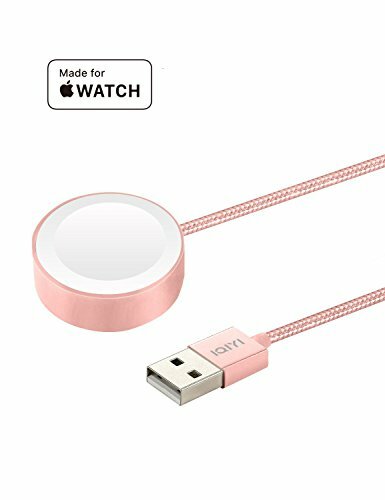 COLORFUL CHOICE-- Silver, Gold, Space Black cable to match your different watch cases.EASY TO USE - Easily adsorb to your watch even in dark thanks to the MAGNETIC module. No disturbing to your family in the sweet night! FAST CHARGING -- Enjoy the fast charging speed in about 2 hours! Fully Charged when you enjoy your tea time.